On line ticket sales for this show are closed. Tickets available by phone or in person - subject to availability. Geeks Rule promotes the study of and engagement with science, technology, engineering and mathematics (STEM) among underserved youth. Our vision is to eliminate the racial, gender and socioeconomic gap in the STEM fields in order to meet the growing need of STEM professionals in the United States. 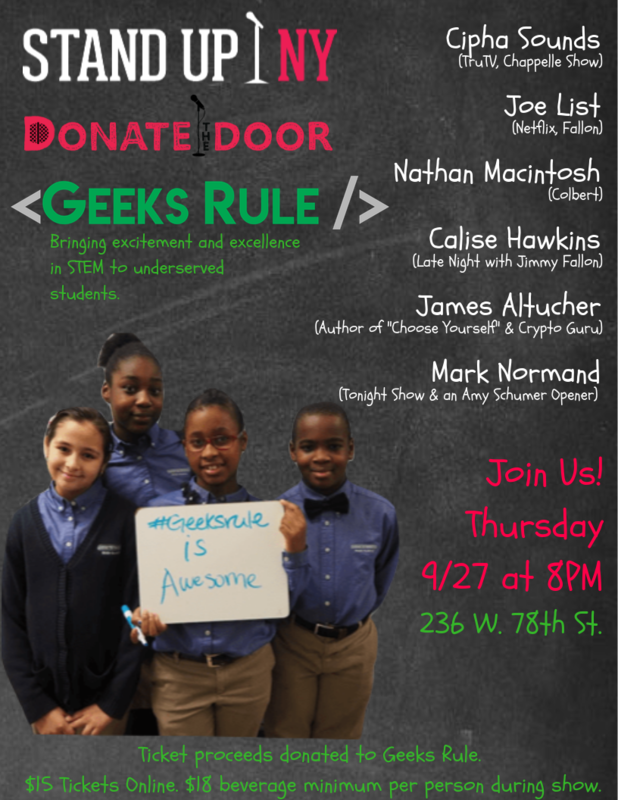 Geeks Rule will help eliminate this gap through hands-on and mentoring programs in the major cities across the U.S. Within five years our goal is to reach 12,000 underrepresented minorities (URMs), with 1,500 having significant, life-impacting experiences in our more-intensive programs. Of this latter group, more than 60% of these students will attend college, with most pursuing studies in a STEM field. "The United States is failing our youth due to an ineffective educational system and a lack of STEM learning opportunities. Our youth are not equipped with the necessary skills to succeed in the 21st Century workplace." Joe List began his comedy career in Boston, Massachusetts in 2000 just weeks after graduating from high school. Since that time he has been featured on The Late Show with David Letterman as well as multiple appearances on Conan. He’s featured in Season 2 of The Netflix Series “The Stand Ups”. In 2015 List was a finalist on NBC's Last Comic Standing and had his own Half Hour comedy special on Comedy Central. His albums 'So Far No Good' and 'Are You Mad at Me?' can be heard regularly on Sirius Radio. List is also the co-host of his own popular weekly podcast 'Tuesdays with Stories'. When not headlining comedy clubs all over North America, List is a regular at the Comedy Cellar in New York City.